Fisher-Price has figured out a smart way for busy parents to keep an eye on their energetic toddler. It's called a Smart Cycle - a stationary cycle that uses TV plug-and-play technology. 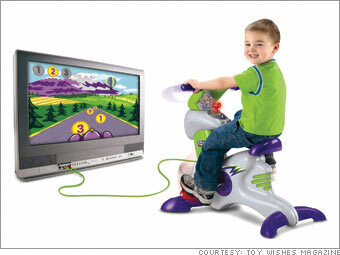 Once the Smart Cycle is connected, kids hop on and start pedaling and steering their "on-screen vehicle." It comes with learning software that contains three play modes. In the Driving Mode, kids pedal through different environments. In the Learning Mode, they can use the joy stick to play games and learn letters, numbers, shapes and colors. In the Big Race Mode, they can race against other vehicles. Fisher-Price said parents can buy additional games like Dora's Friendship Adventure, Sponge Bob's Ocean Adventure and Barbie Fairytopia.